Perched on the bluffs overlooking Hanalei Bay on the North Shore of Kauai, this gorgeous 2 bedroom/2 bath Princeville condo is available as a vacation rental. Here you can enjoy the beauty of the North Shore in splendid comfort. This beautiful 1200 square foot vacation condo overlooks the spectacular North Shore with 180 degree views. Breathtaking ocean vistas feature scenic Hanalei Bay with its sweeping, horseshoe sandy beaches. Watch sunrises and amazing sunsets with Bali Hai on the horizon from your lanai. Spend your vacation playing on Kaua‘i's beautiful beaches, golf courses, and hiking trails. Or simply enjoy the stunning mountain and ocean views from the lanai of this immaculate vacation rental. The vacation of a lifetime awaits you on Kauai's majestic North Shore. • PRINCEVILLE, A GOLFER'S PARADISE… Princeville is a golfer's paradise with both the 27-hole Makai Course and the 18-hole Prince Course within easy reach. • SHOPPING… Princeville Township sits on the bluff overlooking the ocean and offers a great variety of shopping and dining while Hanalei Town is only a short scenic drive. • BEACHES… Enjoy the North Shore's World Famous white sand beaches, award winning golf courses, and spectacular hiking trails. Or, simply soak in the stunning mountain, ocean and waterfall views from the lanai of this immaculate vacation rental. Golfers will enjoy playing the many courses Kaua‘i has to offer. The Makai course is within walking distance of our condo. Take in the ocean, waterfall, and mountain views during your game! This condo has it all--ocean and mountain views on one side and golf course views on the other. Relax on the lanai and take in the mountains that surround Hanalei and the majestic Bali Hai. The views from our lanai and our living room are simply spectacular. Don't be surprised to see the local canoe club paddle by in the evening--or a pod of dolphins in the morning. Our condo is perched on a bluff above the Pacific Ocean, looking across Hanalei Bay at Bali Hai. This condo has a full kitchen, stocked with all the tools you will need to prepare meals. 2 bedrooms/2 BA on 2 levels. Sleeps 4 comfortably. 2 FULL bathrooms; Fully-equipped kitchen. 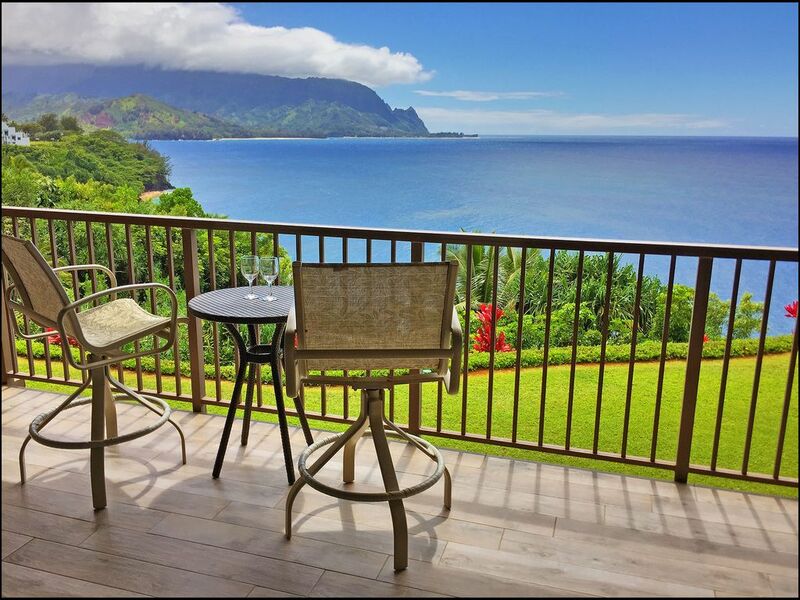 Beautiful lanai overlooking the Pacific Ocean with views of Hanalei and Bali Hai. Washer/dryer, Ceiling fans, Cable TV/DVD. Swimming pool with Jacuzzi. Paved path to snorkeling beach. Beach chairs, towels, and plenty of beach toys. The condo has many recent upgrades, including new furniture, carpet, and kitchen appliances. Even the rental agency was phenomenal. They worked with our early flight and got us in the condo early and we really appreciated all the small additions (welcome book of places to go in the area, short supply of detergent, soap, washing machine pods, shower basics, trash bags, etc). I am delighted to know that you enjoyed your stay! It's always a delight when guests love the view as much as we do! I hope that you will stay with us again! This was our 3rd vacation stay at Pali Ke Kua. All of these vacations were in buildings 1 - 5 which have essentially the same views as this unit. The other units we stayed in had been better maintained, and more completely upgraded, than our recent stay. While this unit definitely has great views of the bay, it is not a good value compared to the other units (with the same view) we have stayed at Pali Ke Kua. I am sorry to hear that you were disappointed. This is surprising to me, however. I will reach out to you privately to ask what things might have made your stay more comfortable. We are always happy to hear feedback so that we may improve. The view is truly spectacular and access to the little beach a big plus. Plenty of room and short drive to marketplace made this a good spot. I am glad you enjoyed your stay! I hope you will come again! This is the third time, over about thirty years, that we stayed on the cliff at Princeville. The view is as breathtaking as ever. The condo was in nice condition, and was well stocked with all the necessities. The beds were comfortable. Unfortunately, I have a problem with stairs, and would have looked for a rental unit with a different floor plan, if the property description had disclosed the stairway that led to the main level. Nonetheless, we certainly enjoyed our stay. We are certainly glad to hear that you enjoyed the view. It is nothing short of spectacular. Thank you for the suggestion that we include a note that the condo includes stairs. We are happy that you enjoyed your stay and hope that the stairs were not too much of an inconvenience for you. Hanging out on the lanai at PKK 224 is so nice it's hard to go anywhere else! Just kidding (mostly) as there are so many nice beaches on the north shore, our favorites being Tunnels, Hanalei Bay, Kalihiwai and Moloaa. Grab a chair and some lunch and head out for some sun. On rainy days or afternoons (there are several of those in November, the wettest month), you can always relax with one of the most beautiful vistas in the world with a refreshment and some pupus. Pick up some rolls or poke at the Dolphin fish market on the way back from the beach. The sunrises and sunsets are always amazing and the surfers are out every day (bring binoculars). Side note: the owners continually invest in new amenities for the condo, with the latest additions including new doors to the lanai (that slide easily and keep the bugs out! ), super fast internet and a 55" Smart TV. Before that they upgraded the classic 70s kitchen and bathrooms with beautiful cherry cabinets and marble counter tops. The kitchen is well appointed with all the cookware you'd ever want. The carpet and couches are super comfy. We appreciate having you as a guest! So glad that you enjoyed your stay! We look forward to seeing you again next year! You will appreciate the improvements we have in store! Great sunset views from Lanai and very detailed communication from the host. Only negative was there seemed to only be 3 beach towels, would have been pretty sparse for 4 people but since there were only two of us it worked out. Overall a great place to stay. We are so happy to hear that you enjoyed your stay! We agree--the views from the lanai are the best on the north shore! Thank you for alerting us that some of the towels have gone missing! We will replenish immediately! Hope you will stay with us again! Aloha! I include Accidental Damage Insurance with each reservation for $49.99 This covers damage up to $3000. Reservation payment is due in full at the time of booking unless otherwise arranged. If a cancellation is made between 60 and 90 days prior to arrival, we retain 20% of the full payment. If cancellation is made 90 or more days before arrival, we retain a $75 cancellation fee and refund the balance. For reservations with a down payment, full payment is due 60 days prior to arrival. Reservations cancelled fewer than 60 days prior to arrival will not receive a refund.